Strange progress this weekend, at this time of year everything has started leaping out of the ground, overwintered vegies and herbs have gone to seed, there’s a reliable 6 eggs a day from the chickens and seedlings are getting visibly bigger by the day. Yet, when I look out the window it doesn’t feel like there’s much that *has* to be done right now… when I stop being delusional, I know in ten days time when I want to plant out many of my seedlings I will need some clear space in the garden beds so #Tub10 is declared – a large plastic tub of ‘no longer wanted’ plants will be cleared each day for 10 days. 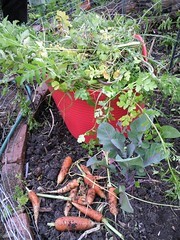 Things like coriander, carrots, rocket, beetroot, chervil are all going to seed. They look so pretty and they have prevented other more troublesome volunteers from taking root. 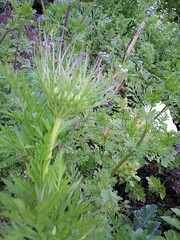 Not to mention the gazillion parsnips that resulted from my reckless shaking of seed heads. Who says parsnip seeds are poor germinators? Many of the parsnips I weeded out yesterday were eating size. 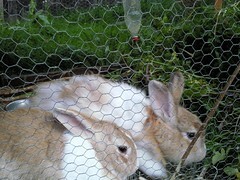 And the little ones were eaten enthusiastically by the rabbits, our ‘Weed Processing Units”. 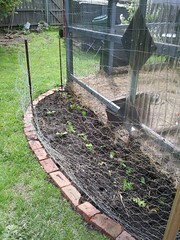 I’ve finished off the new bed out the front of the chook shed, and planted their climbing bean & cucumber sunshine screen at the bottom of the trellis. 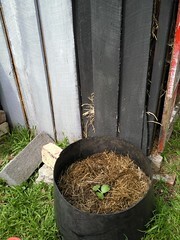 A golden zucchini and white button squash accompany some mixed lettuce at ground level. I am hoping the afternoon sun will treat the plants well, and the laserlite behind the cucumber will give an extra boost of heat and protection. 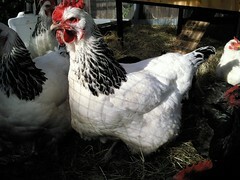 And a great big fence of chicken wire at the front to protect them from marauding chickens. On Friday I noticed someone (I have a prime suspect) had flapped into C6, the bed with brassica seedlings and trampled them. So I moved off the extra wire protection from the salad greens nearby. Only to find the prime suspect aka Gardening Turkey in there later decimating the salad greens while we ate our dinner on the deck. We need to look at higher wire around the garden beds, or perhaps as the first measure, more bamboo stakes to hold the wire more firmly in place. Gardening Turkey was just trying to live up to her name. And we’d grown her such a nice salad too. Well, the library wants their copy of Christine Ferber’s Mes Confitures book back. Sad Day. 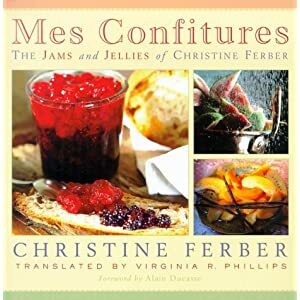 This book is, unsurprisingly for the French speakers out there, a whole bunch of jam recipes. Which is good, but we don’t eat that much jam. 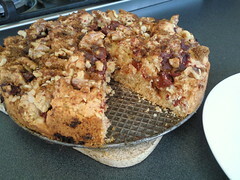 So I have used the book more as flavour combining inspiration. I did make the Quince, Cardamon and Orange Marmalade (p152). Which is to die for. 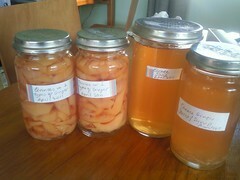 Luckily I have more bottles of quince juice tucked away so I can make more later in the year. 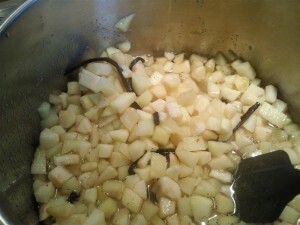 I used the Pear with Caramel and Spices (p187) as an inspiration for some bottled pears which turned out delightfully. My tweaks were: replace making caramel/ toffee with a scoop of dark brown sugar when making a spiced syrup with cardamom, star anise and cinnamon. This works equally well with stewed apples and makes for a quick dessert warmed through. This has got me thinking about more of our preserved fruit next year being ready made combos – eg crumble fillings with apples and berries. Fruit, lemon juice and sugar are combined and brought to a simmer then immediately put into a bowl, covered and left overnight to macerate in the fridge. Sometimes fruit, lemon juice and sugar are combined and simply left overnight to macerate. 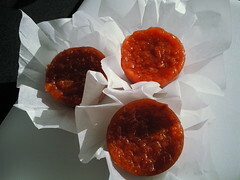 Softer fruit may only be left an hour or so, and is not strained in the next step. The following day, the mixture is strained and juices are boiled until they reach setting point, fruit is added back in and it is boiled another 5 minutes before bottling. 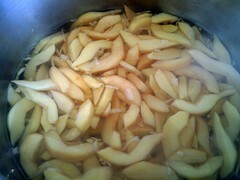 Pectin is added in the form of Green Apple Jelly. Lemon juice aids setting. 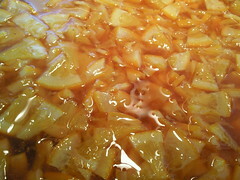 Where fruit juices are used (as in the marmalade reference above), strained juice is left to settle overnight so the clearer juice on top can be used. These technique based attention to details result in a stunning looking preserve. 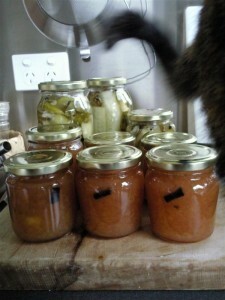 This week I have been grateful for the stash of jars under the house in the garage. 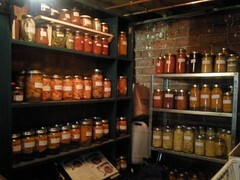 The preserving tally runs at over 370 jars or packets of stuff. Which means using about 1 jar a day through the year. I’ve turned it into a bit of a joke with myself – going ‘garage shopping’. And this week I have bottled 8 jars of pink jam (strawberry & rhubarb). The ginger and lime pickle will be decanted into smaller jars this weekend. the capsicums were bought at roughly 1/3 the price they are now fresh, or 1/10th of the price ready grilled, and formed a fun project for a couple of hours grilling and peeling. Doing 4 kilos at once is quicker work than a couple of capsicums at a time, many times over. They are like red gold in the freezer. the tomatoes came from a farm on Boyer Rd, and taste of summer. To get the same flavour from a shop now we’d probably be eating imported italian tinned ones. the nectarines came from Campania. I think they taste better bottled almost, and no prep is required at 7 in the morning. this is also changing food shopping patterns in the house. Being back at work has meant a shift in my garden time. At the end of yesterday I came home in the dusk, slid on my gumboots and dug some carrots to add to dinner. The need to reconnect with the mud soil was strong. The carrots were a nice addition to a feed of cannelini beans simmered with a pork hock until it all went sticky and delicious. Carrots and leeks added last night upped the vegetable content. Yesterday, the chickens were noisily settling down for the night and sorting out who was sleeping where in their new shed. Tonight, the negotiation was less intense between the chickens. The turkeys (just large chooks really, but that is their nickname) were nesting in the hay under the nesting box. Ginger had managed to get on the lid of the nesting box, for which she has my admiration – only last weekend I clipped their wings to minimise their flying ability. I picked Ginger up and tucked her inside the box with all the other bantams. There’s plenty of space in the nesting box for all of them, but I suspect the turkeys haven’t figured out how to use the ramp up into the nesting area yet. The term ‘bird brain’ definitely applies to those three. The babies are getting noisier and noisier – they must be missing their late afternoon tea I was feeding them as there is a racket when I come down the back stairs at the end of the day. Jet is growing well but still the smallest. She prefers to stand in the food bowl to eat. The garlic planted a few weeks back is up and about 10cm high in C2. No sign of life in C4 yet but that was planted two weeks later. Preserving – 6 bottles of stewed apples last night, 5 bottles chicken stock are just about done in the pressure canner as I write. The pressure canner seemed like a crazy but good idea (number #45 i think) and yet it has been lovely to open jars of mexican beans and mince, or chickpeas and pinto beans ready to use. The chicken stock won’t take up space in the freezer, and won’t need defrosting on the nights we want to make a quick risotto. Beep beep – there’s the alarm. Off to tend to my bottles of preserved goodness. This will be the first year I turn my hand to preserving apples. I know you can buy apples for a lot of the year thanks to cold storage, but we are going to see how useful some jars of stewed apples are in mid-winter to quickly rustle up desserts. During the apple season we will easily eat 4 kilos a week between the three of us. Never having done this before, my interest was piqued by Sally Wise’s apple and apricot charts. And there are more varieties both grown my garden and available at the farmer’s market, so I have some additions and annotations based on initial experiments. Dried Apples Elimination Contestants: Based on tried and tested Masterchef approaches, I went for a top three and bottom three. Clear winners - Mutsu and Jonagold. Mid field - Golden Delicious - Fuji (no pic). Blah - Granny Smith, Pink Lady, Democrat. For drying – our Fujis are spectacular, Jonagolds and Mutsu are equal second, Golden Delicious are great too. For stewing – Fujis, Jonagolds, Mutsu and Golden Delicous. The Pink Ladys and Galas from the garden are wonderfully juicy. Mutsus have been disappearing into bags for lunches this week at a fast rate of knots. We might experiment with storing some wrapped in paper under the house and see how they fare. There are many more varieties to try out! But I didn’t order a Mutsu tree Maybe next year… I’m sure we have room for more. This year I scavenged about 20 kilos of quinces – most of which came from Jack’s family across the road who have an old tree in their sheep paddock. I picked those ones back in early March before my trip away – bottling about 18 jars before I went away to NSW. And eating a few. In the past I’d never quite cooked quinces enough. The hand-me-down slow cooker from Robin’s sister made all the difference. The quinces turned the most amazing maroon overnight, fragrancing the whole house. And begging to be scattered on muesli, warm and juices dribbling, at breakfast time. I came home from my trip to a kitchen smelling of quinces – Sheila, Jack’s Mum, had dropped over another large bag full so I bottled some more, made some quince paste by accident, made some quince-cardamom-orange marmelade and also two delicious cakes, one of which worked it’s way over the road as a thank-you. 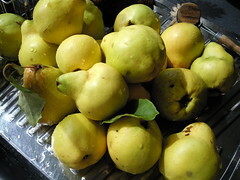 Quince Past by Accident Recipe – prep quinces as for bottling but do a few too many. Put those in a saucepan and cook at higher heat. The quinces will go fluffy instead of holding their shape. Add sugar to taste and cook until the right colour. Set in a silicon muffin tray lightly oiled. The final batch included some from a family friend at Kettering. Inspired by Christine Ferber’s book Mes Confitures, I made some quince juice ready for later addition to apples. And bottled some with both grated fresh ginger and crystallised ginger as a delectable dessert. This was an adaptation of a jam recipe from the same book but we eat more stewed fruits than jam. Still debating whether to tell Robin there is a pot of this in the fridge or quietly eat it myself. Let’s see how quickly he reads this post! And that is the end of the quince harvest, I think. I don’t think I’ve written about the revelation pears have been this year. In past years somehow I’ve managed to eat a few good pears but more often than not they’ve been picked green and turned straight to mealy mush on the bench, or windfalls have been eaten by chickens. Being on leave during peak pear season has been wonderful. We had a bumper harvest from our Williams tree towards the bottom of the garden. We bottled 31 jars and ate quite a few. Each morning through late February and early March I went out with a bucket and collected up on average 3 kilos of fruit. There must have been a good 30 – 40 kilos of fruit off this one tree. The Winter Cole is now ripening after being in the ground since Winter 2008. The fruit is more squat and just as delicious. More like a maximum 3 kilos of fruit I estimate. Nashis! These are a completely different creature to ones you buy in a regular shop. Being able to pick when ripe makes all the difference. They are crisp, juicy and delectable. I’ve bottled one jar as I read they stay crispy to see if we like them. Mum and Dad looked after that harvest while I was away (5 kilos? def more than the Winter Cole, planted at same time). Apparently they make great juice. 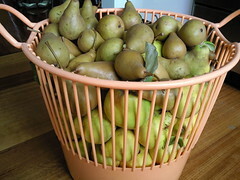 I also scavenged a few kilos of pears from Jack’s family over the road. They have a large pear tree which may be from when the whole valley was an orchard at the start of the 20th Century (see here for some background info – Samuel Joseph Cato is the relevant Cato Family member mentioned) . The small brown pears are plentiful and stay firm when cooked. I used them to make pear and vanilla jam from this recipe. So I ended up tossing the lot in the blender to make for a more jam-like consistency. This is a magic recipe! Next year we will make more jars. I am sure it could be used as bribery. Yes that is a kitten tail leaving the photo. With a boiling water bath, or Fowlers Vacola preserver, it is easy to preserve many fruits and tomatoes for 1-2 years storage at room temperature – basically the high acidity levels combined with the high heat kill the bacterias and moulds that would destroy the food. 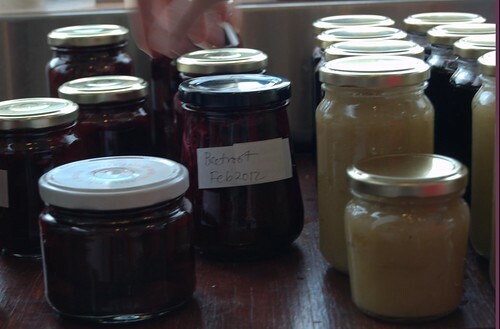 Jams and chutneys have the benefit of high sugar or acid levels making them even easier for mid – term storage. This limits the range of things you can safely store for later, without chewing through power keeping a freezer going or having everything loaded with vinegar or sugar. Also, we don’t have a microwave so defrosting means planning ahead which we don’t always do. But as soon as you start considering lower acid vegetables (anything really unless you want pickles), beans, meat, fish or soups, then you need to keep in mind botulism toxins - nasty and potentially fatal. To avoid this, the foods need to be heated beyond the boiling point of water, and it seems for much longer, to make sure everything inside the jar gets superhot for long enough to stop the botulism spores multiplying and making the toxins. Heating the jars under pressure achieves this. 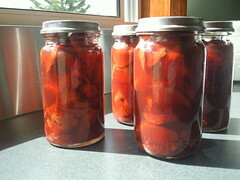 Thanks to some very useful forum posts and articles scattered on the web, and the US government sites with detailed information and guidelines, it actually seems practical to ‘pressure can’ some alternates to the apricots and tomatoes that I’ve preserved in the past. The cheaper Australian dollar also made it quite feasible to buy in the requisite toy device from the US. In doing my research, I’d found a simple looking recipe that ought to suit our tastes: Many Layered Chili. Expecting delivery this week I’d bought the ingredients in preparation. And decided that if the jars exploded or spewed their contents everywhere I wouldn’t be too surprised and I wouldn’t have lost hours of work in prep! I did a test run first just with water bringing the canner up to pressure, no jars or ingredients to worry about. That all went smoothly, so I prepped up the jars of chili beans and meat. After loading up the canner, and getting it up to pressure I realised that I had not put in the bottom rack for the jars to sit on, using instead the jar lifter contraption. So at that point I figured if the jars didn’t explode from the beans swelling up, they’d crack from too much heat on their bottoms. Sigh. I then realised just how long 90 minutes can be, ducking in and out to the garden, and filling in time with small jobs and pushups so I wasn’t too far away from the kitchen. The kittens just slept. They didn’t taste bad either. We had some for dinner on Friday night to see if we liked the recipe before doing a big batch. Definitely worth repeating with a touch more spice. It felt mighty strange to leave the jars sitting around the kitchen for two days. ‘Shouldn’t they be in the fridge’ asked a little voice in my head. I told it to shut up and ate. On Friday I did baked beans using Mum’s recipe and referring to the USDA site for timing, and also some chickpeas – much cheaper than buying tinned. Buying dried beans and cooking them ourselves is a lot more efficient in terms of transport – the organic tinned versions I can buy easily are from Italy. I can buy organic dried beans here, cutting down on transport costs. Every so often I’ll cook dried beans in bulk then freeze them but much prefer the convenience of tinned, or now, home canned. I can see foods like this that are standard meals in our house being brilliant to have in a jar for dark winter evenings, or lazy summer ones.